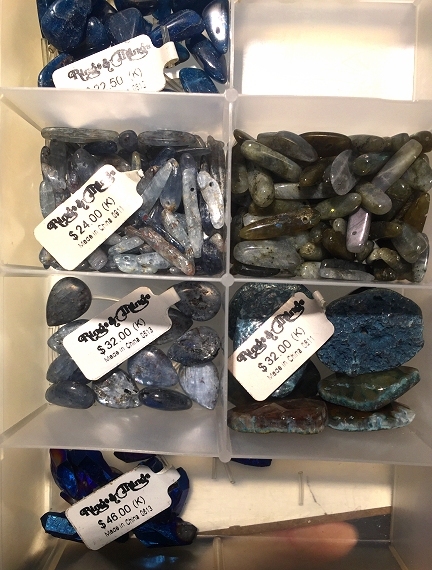 When you first start jewelry making and beading, one of the first things you will discover is that you need storage for your beads and jewelry components! 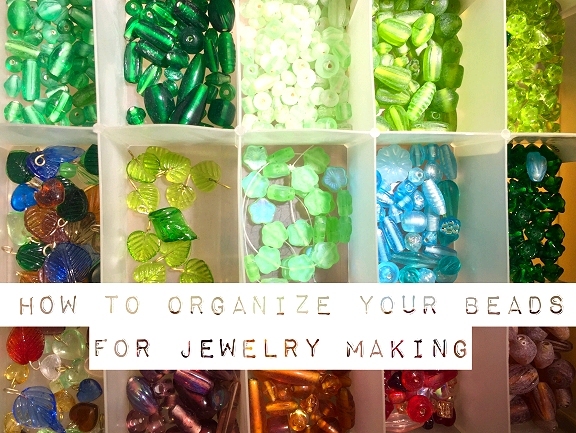 I think it's really important to be organized from the get go—it's a real pain to try and organize in a particular way if in the beginning you just lump all of your beads together, so start out by thinking about how you would like your beads organized, and then follow through with that. In this blog post I am going to share with you how I organize some of my own beads and components for jewelry making. Everyone has their own ways of doing things. The following are the things that worked best for me, but by all means, do what works best for you! I organize my beads in a few different ways. First off, I organize by color. 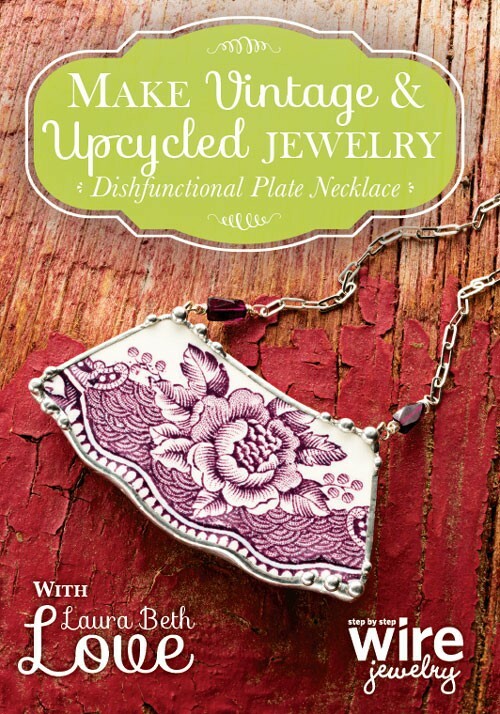 This is especially helpful for jewelry making, because obviously you are going to be creating things that most often are color-coordinated, so it makes sense to have all different shades of, say, green - together so that you can see the differences in hues and shades and tones, all in one box. Doing it this way makes it easy to pick just the right color. I also organize my beads by material. I most often use beads that are stone and glass. 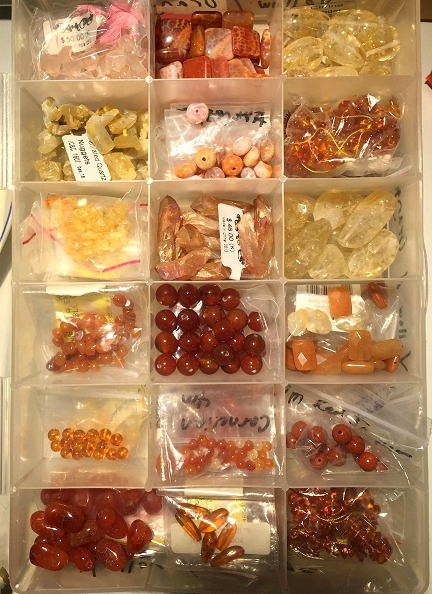 I have a lot of stone beads, and I have a lot of glass beads. Sometimes I mix these different material beads in one project, but most often I create something that is strictly all gemstone/stone, or all glass. 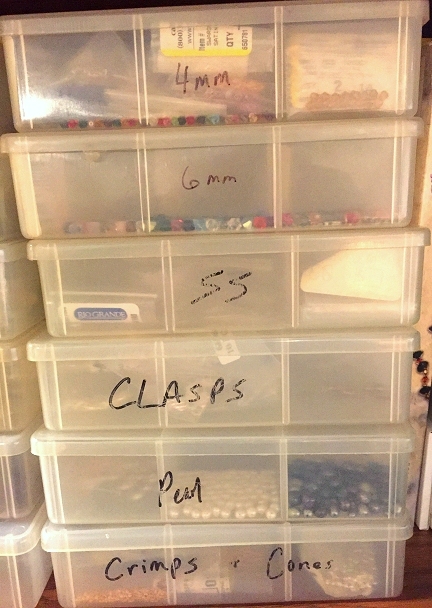 That being said, I have one set of boxes that are all stone beads, and another set of boxes that are all glass beads. Both sets of boxes are arranged by color. I have one specific box for each color or color family. 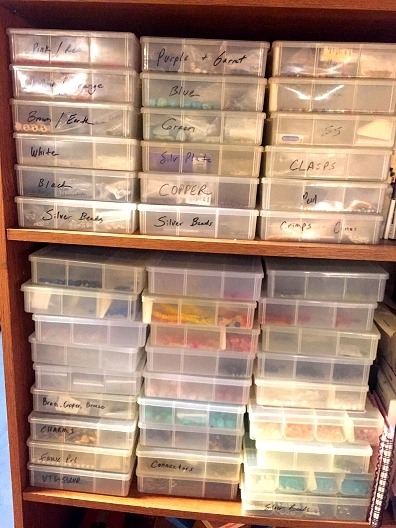 I use standard plastic bead boxes that I bought years ago at a craft store - I think it was either Michael's or ACMoore, and I think they came in packs of 2 or 3 or 4—I forget—but my point is that you do not need anything fancy or expensive to store your beads in. 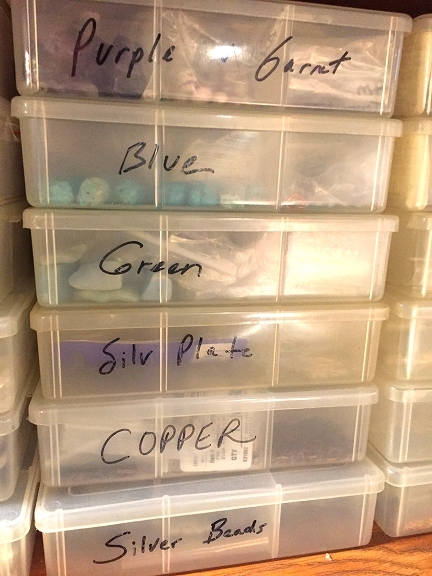 The containers I use each have about 17 separate pockets for beads, which stores plenty per box. I keep most of my boxes stacked in an old bookcase, which works great since it allows me to keep them at eye level and easy to reach. Here you can see a few of the examples of my organization by color family. 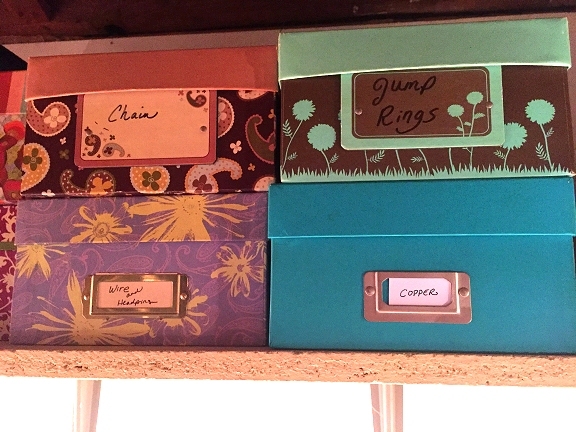 I have one box for pinks & reds, one for yellows & oranges, one for browns & earth tones, etc. 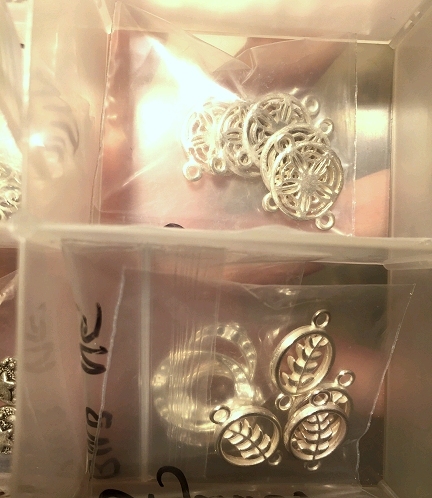 I also have boxes for different types of metal beads and different finishes. 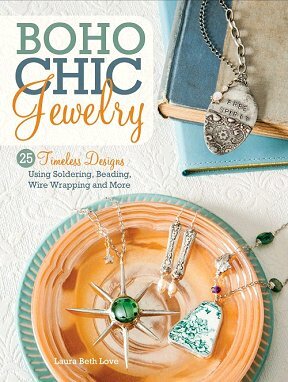 There are sterling silver, silver plated, copper, vintage silver, etc. I keep special rows of boxes that contain the things that I use most often. This makes it easy to grab them without searching. 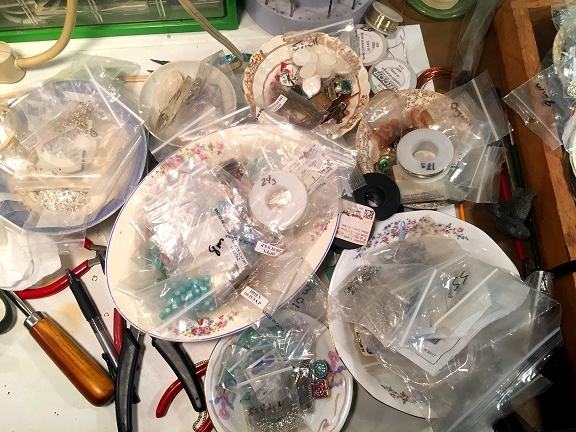 Things like pearls, clasps, sterling silver components and Swarovski crystals—I box the crystals by size...one box for 6mm, one for 4mm, etc. 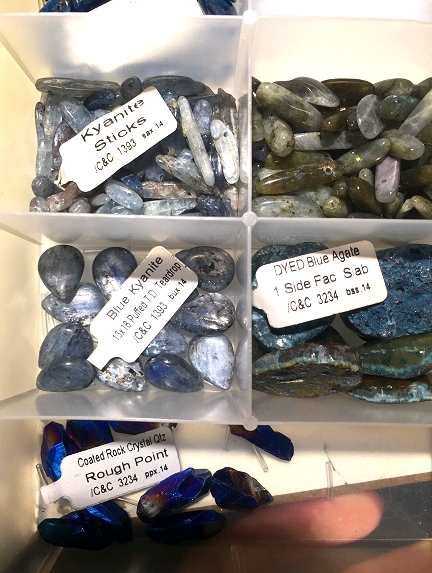 Here's a peek into one of my blue stone boxes. 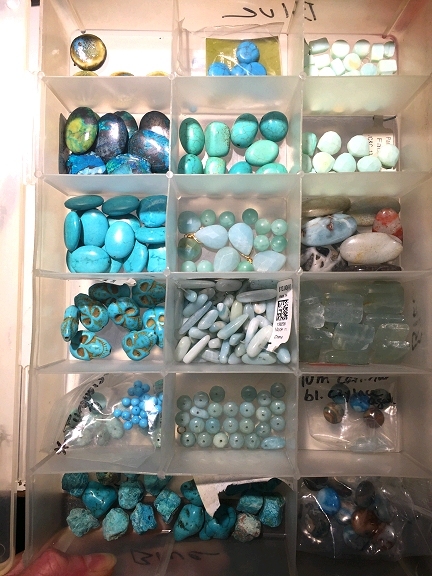 I have a few blue boxes—one for turquoise shades, one for true blues, one for greenish-blues, etc. Here's one of my yellows & oranges boxes, where I store things like amber, carnelian, and citrine. 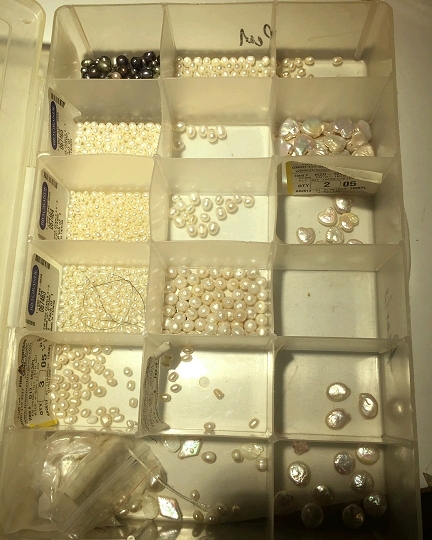 Here's one of my pearl boxes - I try to organize them by size and shape. I peel the sticker labels off of the bags that they arrive in from the supplier, and stick those labels into the box sections with the beads. This makes it easy to see the sizes at a glimpse, and makes it easy to reorder them if needed. Here you can see that I saved the bead-strand tags and put them in with the beads. It can be easy to forget what stone is what! 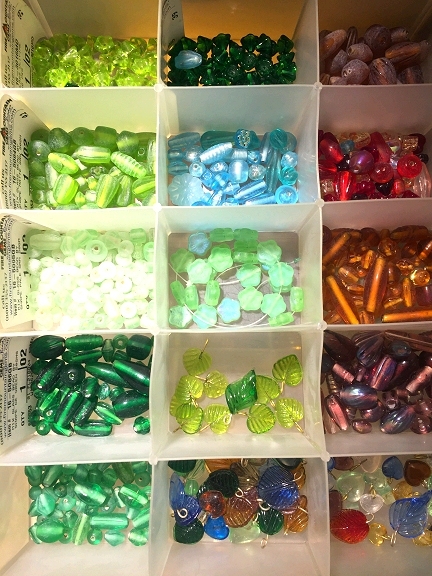 Keeping the prices with the beads is essential to determining how to price your finished jewelry. Just how much did you pay for those beads? How much for the strand? How many were on the strand? How much does that come to per bead? Here is the same photo showing the reverse sides of the tags. 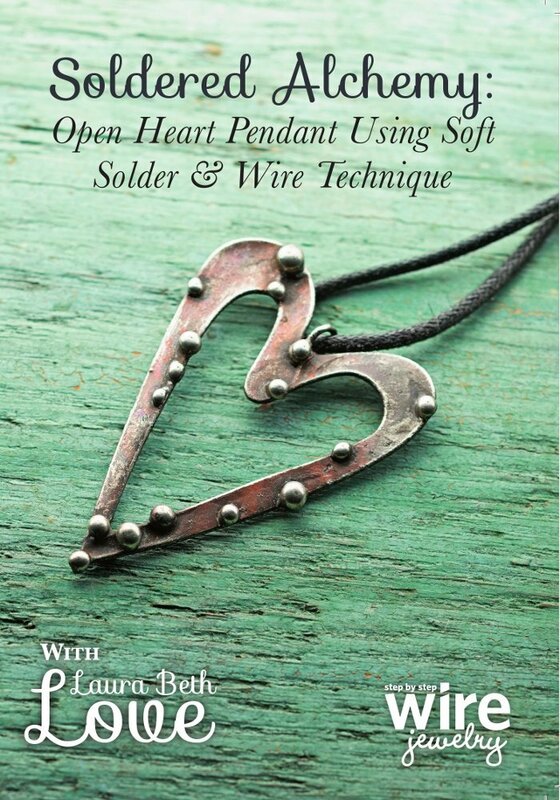 Here it tells you info such as: how many beads were on the strand, the name of the stone, whether it was treated (dyed, hardened, etc), and a brief description of shape and or size. I like to keep metal components in small plastic bags to deter tarnishing, which is oxidation of the metal from it's exposure to air. 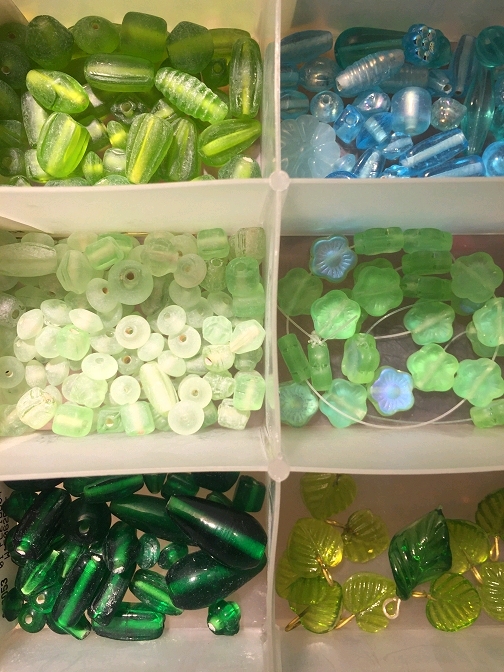 Here is a box of my glass beads, greens with a few other colors. I keep many other supplies in these photo boxes that you can buy at most craft stores (I think I bought mine at ACMoore.) 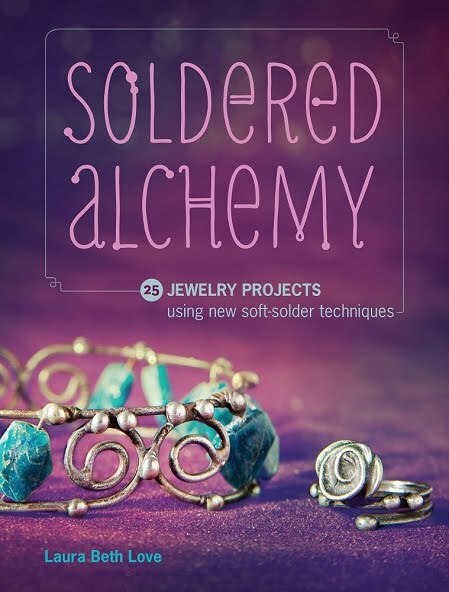 These are great for storing wire, chain, jump rings, and headpins—things I buy a lot of. And finally, no matter how organized I keep my supplies, my workspace usually looks like this! 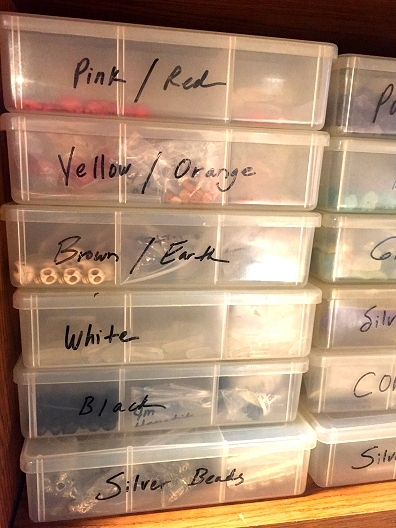 I hope you enjoyed this peek into my bead storage and organization and hopefully you were able to take away a good hint or two for organizing your own beads and jewelry making supplies! 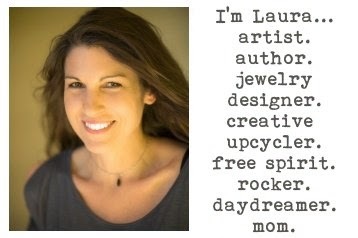 Happy jewelry making!